I took my MBP to a friend's house and it started acting weird. It was very sluggish and things kept locking up. When I got home I ran Disk Utility and found that I had all kinds of permissions problems, and a "Sibling Link Error" that could not be repaired. I Googled the error and tried several options but nothing worked. One of the suggestions that kept coming up was to purchase Disk Warrior. I went to their site and read all of these user emails that claimed that Disk Warrior was incredible. They actually sounded like the company wrote them so I figured it was just marketing. I was skeptical, but I gave it a shot. At $99 I knew I was rolling the dice but I had no other option. This is a relatively new 500GB disk that I put in my MacBook Pro, and I didn't want to have to reformat. Reformatting is easy, but I'm running PGP Whole Disk Encryption. If I reformatted I would have had to re-encrypt the drive and that takes about 24 hours. So, I went for the $99 solution and it worked. I couldn't believe it. 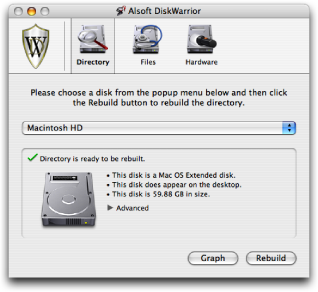 Normally these types of software solutions don't really work, but Disk Warrior actually fixed the drive and it has been running smoothly ever since. There is a chance that the drive is actually going bad which is why I had a problem in the first place. It could be that Disk Warrior just bought me some time. Normally when drives go bad you hear something though, and I hear nothing. My drive has been running smoothly for several days now so I'm fairly confident it's fine. Do I think the $99 was worth it? Probably, but I still think it's an overpriced piece of software. They should really charge $49 for it in my opinion. It did work though. I'm a believer in Disk Warrior now!